The days are getting longer and summer is finally approaching. Alongside sunshine and festivals, there is also high heat and humidity causing excessive frizz. Some of us can survive with a few products, but there are those of us who just can’t seem to keep the frizz away no matter what we try. Well, have you tried a Keratin treatment? Keratin treatments are designed to smooth out the hair giving off a sleek appearance. Read on to find out why you should get one. Keratin is the main protein in hair and nails. If your hair is porous either naturally or from damage, chances are you are also lacking some keratin proteins. A lack of keratin in the hair can lead to dry, damaged and breaking strands. A Keratin treatment will help you prevent all this by filling in the holes and adding that keratin protein back into your hair. The results are a sleek, shiny look that can even be easier for you to blow dry and style on your own. Getting a keratin treatment can take you some time in the chair. At XEX, we offer two types of services: Keratin and Keratin Express treatments. Both yield the same results, but they do differ in process. An express Keratin lasts 6-8 weeks and is usually an hour and a half visit with your stylist. A full Keratin treatment lasts you six months, but will vary from person to person as far as how long you’ll spend at the appointment. These can take at least a couple of hours to complete, but will last you a lot longer. Your hair will be saturated first with the solution. This will coat the hair and allow the porosity to fill in. After it sits, the stylist will then shampoo you with a keratin safe shampoo and condition with a keratin safe conditioner. Then, your hair is blown out and flat ironed to really seal in the treatment. Another thing that is different when it comes to a full Keratin treatment and the express is the aftercare. An express treatment is done when you leave the salon. This means that, besides special products, you don’t need to take any special precautions. A full Keratin treatment isn’t so simple. The first important thing to note is that you have to wait 72 hours before you can get your hair wet. This means: no washing, rinsing, sweating or getting caught in the rain. In this time, you also should wait to use any styling accessories in your hair. Keratin treatments leave hair in a very sensitive state the first 72 hours. Wearing any sort of barrettes, headbands, hair-ties, glasses (over your hair/pressing against the hair) or hats will all result in dents wherever the accessory was place. So, it’s best just to grab some keratin safe dry shampoo after your visit to keep your hair looking good while you’re waiting for the 72 hours to be up. You can use a silk scarf to gently tie hair back from face, but make sure not to tie it too tight. If your hair does end up getting wet before time is up, you should immediately blow dry and flat iron it. 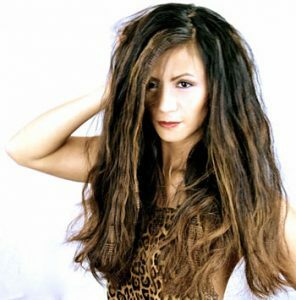 If you’re concerned about the state of the keratin even after you do this, go see your stylist to see what they can do to help. It’s extremely important that all your products are safe to use for keratin treated hair. All your products should be free of sulfates and sodium chloride. These chemicals have the tendency to remove the treatment from the hair leaving frizzy, dull results. XEX stocks Keratin Complex shampoos, conditioners and treatments to help keep your hair lasting. We carry both color care and purple shampoos and conditioners, so whatever your hair, we have you covered. Your stylist will be more than happy to help you choose products that fit your lifestyle and also suit a Keratin treatment. If you follow a certain ritual in the morning, let your stylist know what your go-to products are. If they’re not keratin-safe, we’ll find you an alternative that is! If you suffer from summertime frizz, are longing for sleek and shiny hair or just want to be able to style your hair quicker, a Keratin treatment may be for you. Not every hair type should get a keratin treatment, and sometimes it’s not recommended on overly porous or damaged hair. Before you make your decision, be sure to book a consultation with your XEX stylist to ensure that the Keratin treatment is right for you. “If it’s not broke, don’t fix it”. You’ve probably heard this phrase before and used it several times in your life. We often resort to this thinking after trying something new and not feeling completely satisfied with the results. So, instead of wasting money again, we shrug it off and reach for the same thing we’ve come to know and love. This phrase can be used for many things, but today we’re going to talk about your shampoo and conditioner. Although it may seem like no biggie to stick with the same combination, it’s important to remember that your hair is different at different points of the year. Your hair may be drier in the winter, more oily in the summer and frizzy during Fall and Spring. Using the same shampoo and conditioner all throughout the year can result in unsatisfactory hair. Read on to learn the importance of changing up your shampoo and conditioner to put your best hair forward. Your hair isn’t going to ‘get used’ to your shampoo and conditioner, so you don’t have to worry about it not doing its job; However, using the same combo for a long time can result in buildup throughout the year. It’s also good to keep in mind that your hair isn’t the same all throughout the year. So, when should you be switching it up? There’s no ‘right’ time to change, but there is a right ‘feel’. The moment you start to notice changes in your hair (dryer, duller, oily, etc) is the moment you should start thinking about switching up your products. Getting to know your hair and what it needs to look its best is important. Talking to your stylist about what is happening at the time can help them consider the problems you’re having and which product will help to improve that. If you notice your hair feels drier, grab something for moisture. If you see that you’re suffering from brittle ends, get something focused on reversing damage and so on and so forth. When it comes to changing what you know, you may have a hard time deciding which product to go with. A hydrating shampoo may be good because your ends are dry, but if your scalp produces excess oil, you don’t want to add more moisture into that. If you don’t need a heavy conditioner for your ends, but you notice your scalp is dry, you shouldn’t get a moisture-rich conditioner. Try thinking of your hair as two parts: top and bottom. The top of your hair consists of your scalp and new growth. When considering your scalp, you should be considering shampoo. If you have excess oil, you don’t need a shampoo that is going to add more. Try considering a shampoo such as Aveda’s Rosemary Mint or Shampure. These are your basic shampoos that will get the job done without any added help. For dryer scalps, Aveda’s Dry Remedy Shampoo will help encourage hydration. If you color your hair, it’s best to get a color safe shampoo like Aveda’s Color Conserve since shampoo is the more ‘stripping’ of the two, this will help keep your color nice and fresh looking. When it comes to your conditioner, you should think about your ends and whether or not they’re dry or damaged. If you color your hair but keep the ends light, a color-safe shampoo and a damage repair conditioner would be a great combination for you to try. It’s all about paying attention to your hair and what you’re looking for for your scalp and for your ends. You may not need excess moisture on your ends, but your scalp could use it or you may have too much at the scalp, but your ends are dry and brittle. Feel your hair and take a mental note the next time you need to purchase more shampoo and conditioner. At the end of the day, it’s important to switch up your shampoo and conditioner. Not only will it help keep your hair looking its best in every season, but you also get to try new and exciting products to see what they can do for you. If you’re at a loss or are trying to be a little more cautious when it comes to new things, don’t worry. Your XEX stylist is here to listen and help you out. All we want is for you to look and feel your best so it’s our job to let you know what products will help! Congratulations to Christine DeMaio on winning our 185th High Five Giveaway and thank you to all who entered! 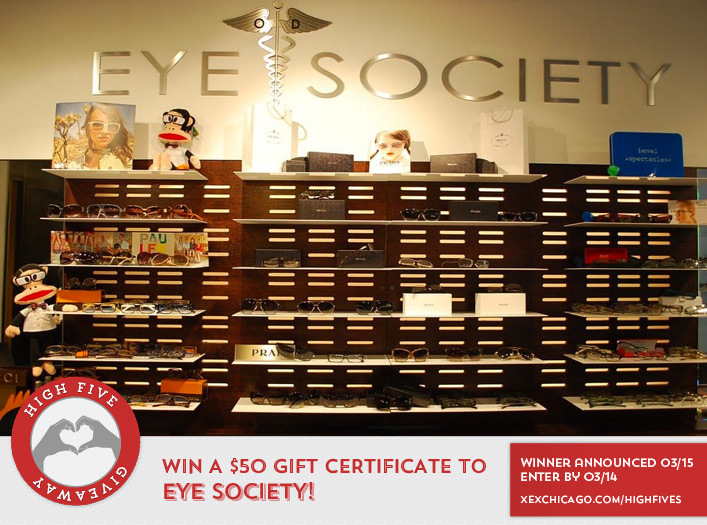 Our next giveaway is for a $50 gift certificate to Eye Society. What is the name of our Anti-Cruelty Society “Pet of the Week” for February 14, 2018? Now, just add a comment to this post with the right answer to be eligible to win! The winner will be announced on Thursday, March 15. Entries must be received by midnight on Wednesday, March 14.